Known in the US as hominy in the US, maí­z cacahuacintle is one of the favorite types of corn in Mexico. 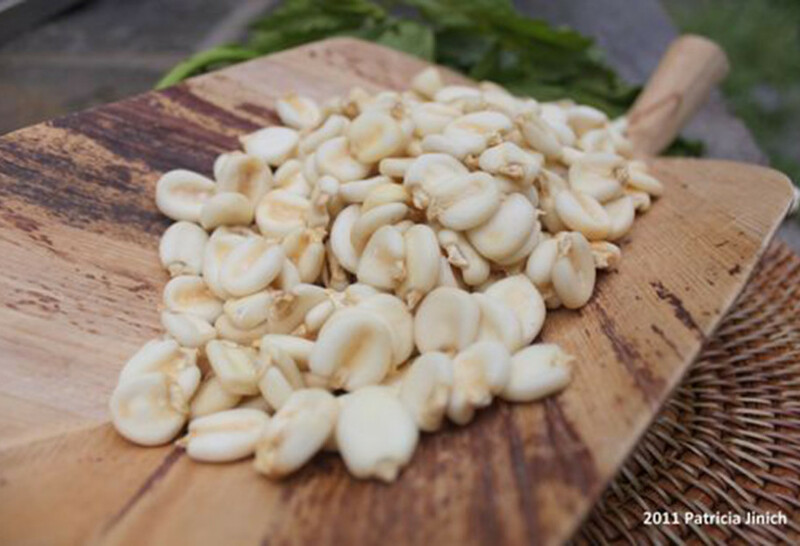 It has giant kernels that are whiter, softer, thicker, with rounder tops, than the regular white or yellow corn. It also has a deep, mealy bite. Its traditional name, cacahuacintle comes from the combination of two náhuatl words, cacáhuatl and centli, meaning corn and cacao, because of its size, mostly. Though this giant corn is most used to make pozole, it is also used to make other dishes like tamales, sweets, drinks, and is eaten in street style crazy corn. When you buy dried hominy in the stores, it has already been peeled and what we call, beheaded, or descabezado. That means that it has been already lightly cooked in order for the tough part that connects the kernels to the cobs -known as cap- to be removed. Cooking it is simple, just throw it in the pot, cover it with water, and wait for it to bloom… for about 3 hours. Literally to open up. That’s how you know it is ready. And just like beans, you don’t add the salt until the end, or it will toughen the kernels as they cook. If you don’t fell like cooking it, you can already buy it fully cooked in cans or in bags in the refrigerated sections of some Latino stores. I’m anxious to try this recipe. I only recently found dried hominy in the store. All I’ve ever known, even though I live in Texas is the canned version. Since this takes so long to cook, I’d like to know if it can be cooked ahead of time and frozen to use later? I am so glad to have found this entry. I have used Goya canned hominy/mote blanco to make pozole but I have not been able to find it anymore. However, I found dry & peeled Mote/Giant Corn from Peru Belmont brand) and was wondering if it was the same type and if I could use this instead to satisfy my pozole craving. I live in Central America so my options to find maiz pozolero are close to none. Thanks for your ideas and suggestions! Yes you can!! That is the same corn. You just have to make sure you cook it until the corn kernels “bloom” or open, like pop corn sort of… I have a recipe for red pozole in my new cookbook too! Thank you!! Please let me know what you try!